Peter, Peter, Pumpkin Eater….pump your kith and kin with this bold and beautiful sweet veggie and see them sprint to a healthy, nutritious diet. Enjoy them ebbing in calories amidst a generous flow of fibre, vitamins and minerals, packing themselves with proteins all the way. Why leave yourself out, Pete? Join them in their race to great health! Called by many other names like Sugar pumpkin, Pie pumpkin, Baking pumpkin, Golden nugget pumpkin, etc. the secret behind the bright orange hue lies in beta carotene that boosts eye health. While savoring the earthy flavour and sweet taste of the creamy orange flesh don’t forget to save the shell and the seeds, for its true treasure lies here! Red chillies 6 to 8 nos. Wash sweet pumpkin in salt water. Drain the water. Remove the seeds. Cut the vegetable into small cubes with the skin. Boil the vegetables in a vessel along with ½ litre water, tamarind paste, curry leaves, turmeric powder and salt for about 10 min. Dry fry til, methi, jeera and red chillies seperately in a small kadai. Transfer it to a plate and let it cool. Grate raw coconut and grind it along with the above dry fried ingredients. Use little quantity of water to grind it to chutney consistency. Mix this ground chutney to the boiling vegetable. At this stage, add little more salt (check if required) and jaggery, if desired. Continue boiling for another 5 min. The tempting flavour you get at this stage tells you, it’s time for seasoning. Heat oil in a small skillet. Put mustard seeds. When they crackle, add black gram and then broken red chillies. Switch off the flame. Add asafoetida and immediately pour it on to the boiling gojju. 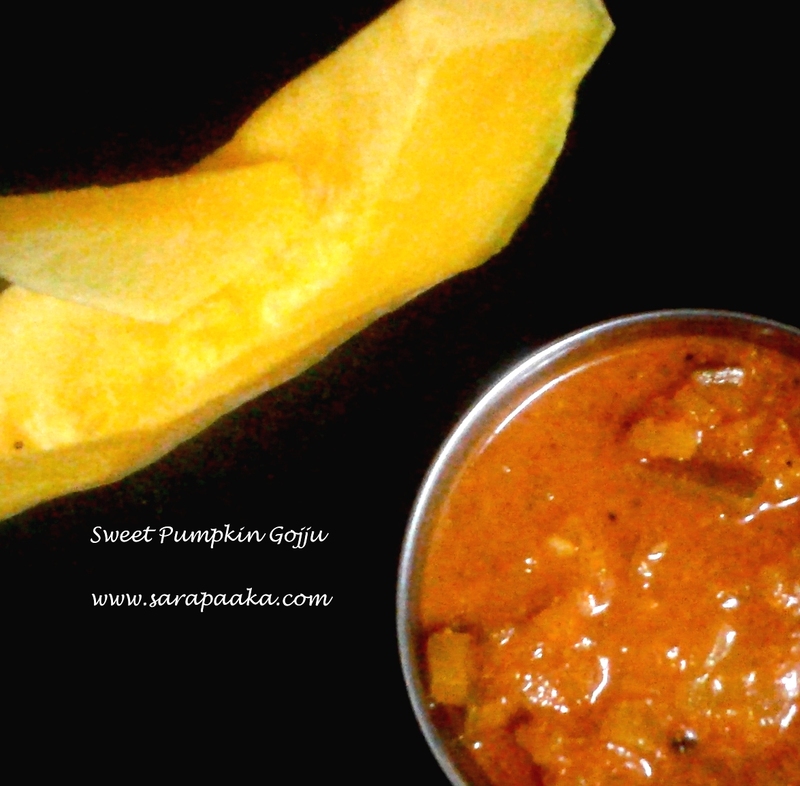 Sweet Pumpkin Gojju is now ready. Use it with rotis, hot steam cooked rice or dosas. What’s gojju…did you ask? Read all about it in “Tamarind Gojju” recipe from this blog. Also view other gojju recipes in our blog “Raisins Gojju” “Onion Tomato Gojju” “Lime Juice Gojju” and “Cucumber Onion Hasi Gojju”.